The Simplicity 8' Straight telescopic banner wall displays a 94.5" wide fabric banner that can be any height from 33" to 85". The Simplicity 8' Straight telescopic banner wall displays a 94.5" wide fabric banner that can be any height from 33" to 85". 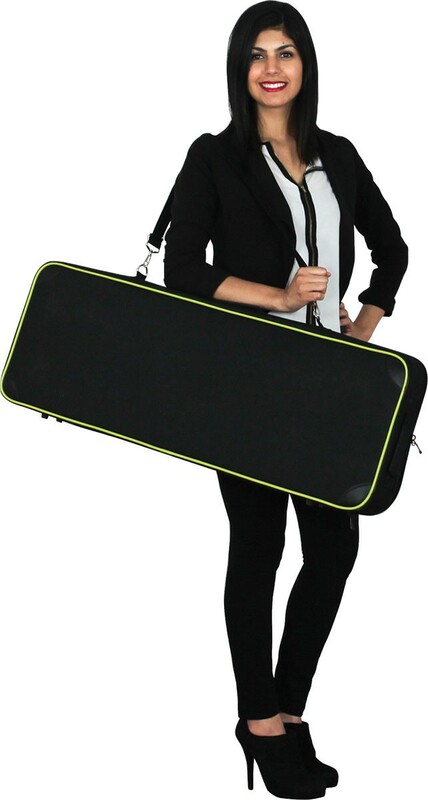 This makes for an easy and inexpensive seamless display for photo shoots, step and repeat logo banners for press conferences, back wall for trade shows, or displays in stores, theaters and airports. 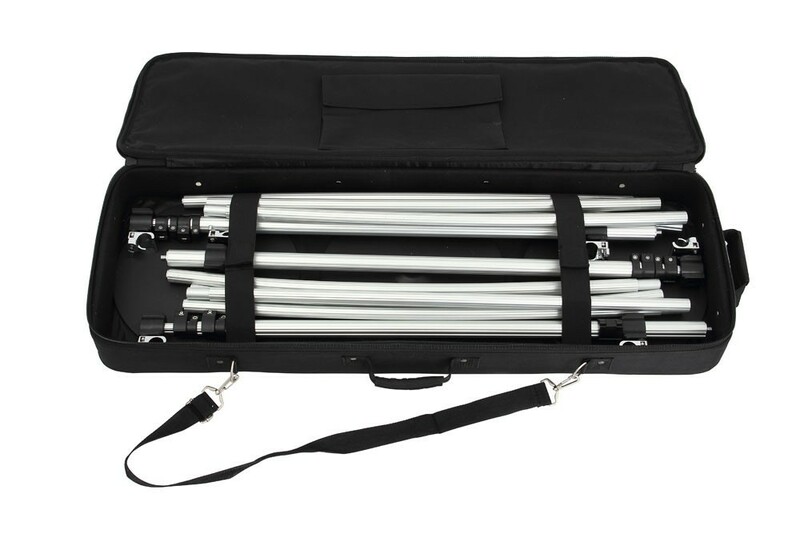 The Simplicity 8' Straight Banner Wall consists of two flat, low profile bases with two telescopic support poles, and two 3-part bungeed horizontal top and bottom cross bars. Double sided configurations are also possible. The fabric banners have pole pockets at the top and bottom to hold the vertical cross bars. Fabric banner options are shown at the full height of 85", but other sizes can be ordered by contacting us. 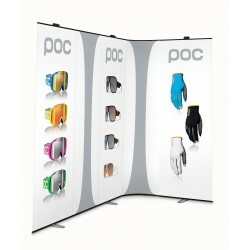 While this display was created with intent of displaying a fabric banner, vinyl banners can also be used. Because of the large graphic size, fabric banners are recommended because fabric can be folded for shipping and storage without causing permanent wrinkles. That makes them much more cost effective to ship compared to a vinyl banner which has to be rolled to prevent wrinkles and creases. Fabric also has the least reflective finish, so it's excellent for photo or video backdrops where glare from lights or flashes is a concern. 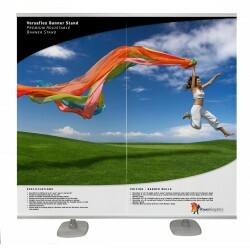 Fabric is also lighter, so the display is cheaper to ship and easier to transport. 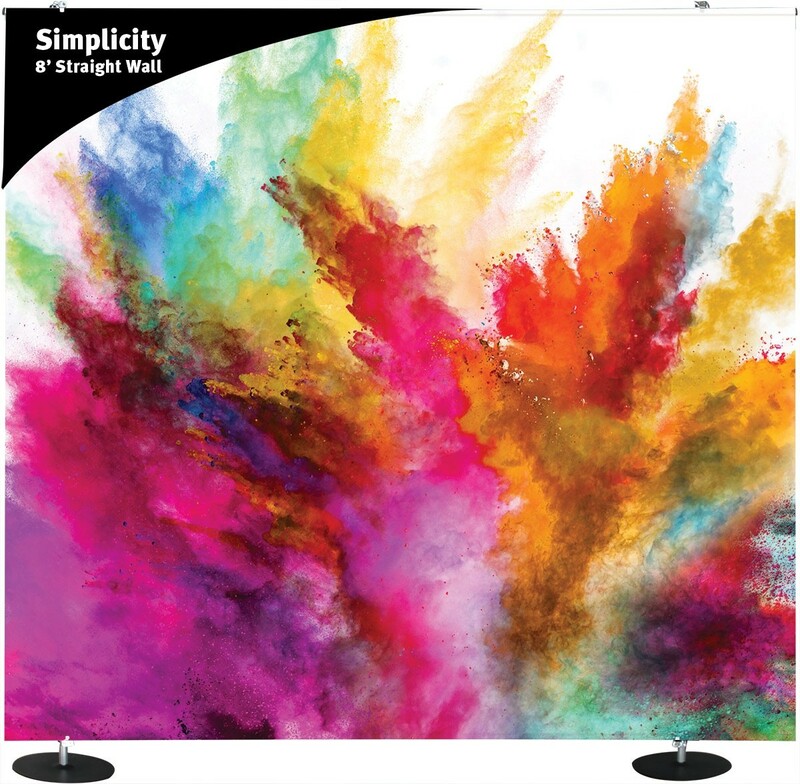 The Simplicity 8' Straight telescopic banner wall displays a graphic with a visual area of 94.5" wide x 33" - 85" high. Includes a soft carry bag. Looking for a higher-end or less expensive model? The Expolinc Fabric System would be an upgrade while still being a similar style display. The Expolinc Fabric System comes in a range of different sizes, is more durable with a lifetime warranty and has can be reconfigured into different shapes by adding and removing sections. 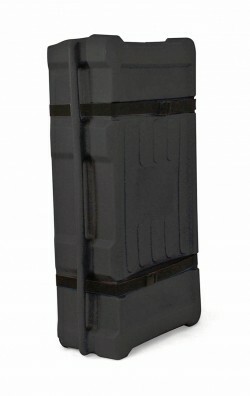 A hard shipping case is a great option when traveling with the Simplicity, and the Large Rectangular Molded Shipping Case is the recommended model, and it can be found in the Related Products tab. 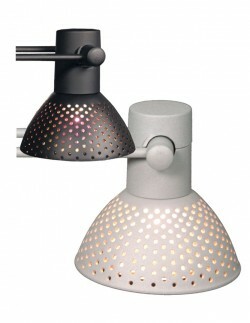 Lights are a popular add on, and the Lumina 8 is the recommended light for this display. It can also be found in the Related Products tab. Banner height: 33" to 85"
Footprint at maximum size: 94.75" x 12"
Shipping size: 40" x 16" x 6"
These templates provide a framework for designing your banner and show the live area as well as the portion of the banner that is used to make the pole pockets that isn't visible when the stand is in use. If you would like a banner design, we offer those for a reasonable fee in the Banner Designs category.